Artificial neural networks (ANNs) exhibit learning abilities and can perform tasks which are difficult for conventional computing systems, such as pattern recognition, on-line learning and classification. Practical ANN implementations are currently hampered by the lack of efficient hardware synapses; a key component that every ANN requires in large numbers. 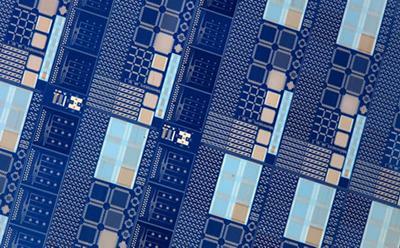 In the study, published in Nature Communications, the Southampton research team experimentally demonstrated an ANN that used memristor synapses supporting sophisticated learning rules in order to carry out reversible learning of noisy input data. Lead author Dr Alex Serb, from Electronics and Computer Science at the University of Southampton, said: “If we want to build artificial systems that can mimic the brain in function and power we need to use hundreds of billions, perhaps even trillions of artificial synapses, many of which must be able to implement learning rules of varying degrees of complexity. Whilst currently available electronic components can certainly be pieced together to create such synapses, the required power and area efficiency benchmarks will be extremely difficult to meet -if even possible at all- without designing new and bespoke 'synapse components'. Acting like synapses in the brain, the metal-oxide memristor array was capable of learning and re-learning input patterns in an unsupervised manner within a probabilistic winner-take-all (WTA) network. This is extremely useful for enabling low-power embedded processors (needed for the Internet of Things) that can process in real-time big data without any prior knowledge of the data. Co-author Dr Themis Prodromakis, Reader in Nanoelectronics and EPSRC Fellow in Electronics and Computer Science at the University of Southampton, said: “The uptake of any new technology is typically hampered by the lack of practical demonstrators that showcase the technology’s benefits in practical applications. Our work establishes such a technological paradigm shift, proving that nanoscale memristors can indeed be used to formulate in-silico neural circuits for processing big-data in real-time; a key challenge of modern society. This interdisciplinary work was supported by a CHIST-ERA net award project and the Engineering and Physical Sciences Research Council. It brought together engineers from the Nanoelectronics and Nanotechnology Group at the University of Southampton with theoretical computer scientists at the Graz University of Technology, using the state-of-art facilities of the Southampton Nanofabrication Centre.